The SIMON® product suite is a cloud-based technology platform for employee benefits management. Each product in the SIMON suite is fully integrated, creating a seamless experience for employees, employers, brokers, carriers, third-party administrators (TPAs), and more. Our intuitive products are designed with a consistent and effortless user experience across all carriers, plans, and devices. Our 100% responsive-design products support any device and take the user experience to a whole new level. To say we’re proud is an understatement. Underneath the hood is a powerful platform built for security, performance, and accuracy. As a trusted leader in our industry for over two decades, we’ve taken the time to build this right. SIMON is Vimly’s online benefits management system—a sophisticated platform that simplifies the complexities of managing employee benefits in a highly secured environment. The SIMON platform is accessed through a beautiful and intuitive web interface on any desktop, tablet browser, and mobile devices. 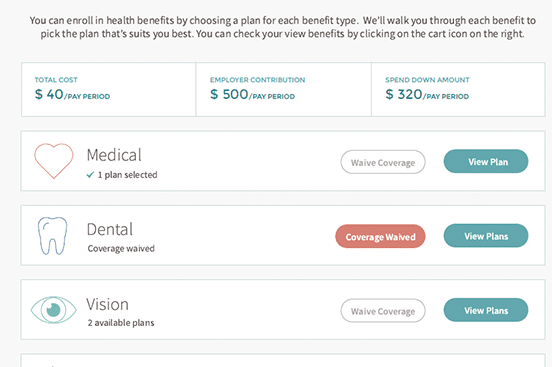 The SIMON employer portal enables efficient, error-free enrollment, as well as access to other tools powered by Vimly’s employee benefits administration platform. This includes powerful integrated data connections with carrier partners. Consumers interact with businesses wherever they go and expect mobile-optimized sites that work on any device. Having a mobile-optimized site is a can’t-miss requirement for engaging consumers. Why pay five bills when you could pay one? Employees are expecting better benefits, and employers increasingly must grow their offering just to stay competitive. Managing multiple bills from several carriers creates a huge administrative burden. We deliver a single consolidated bill and remove the hassle for you. Simplify your processes. Get stuff done faster. Save some trees (and maybe some money too) by going paperless with eSignatures and electronic workflows.